PRE-FRAMED Rangers Mutli Signed Shirt – 9 In A Row League Championship Wins – Signed Sports Memorabilia – A1 Sporting Memorabilia. 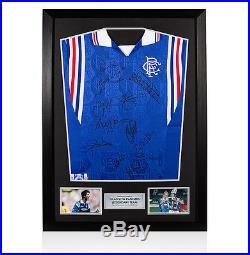 PRE-FRAMED Rangers Mutli Signed Shirt – 9 In A Row League Championship Wins. This framed retro Rangers shirt has been personally signed by the Rangers 9 In A Row Legends Paul Gascoigne, Ally McCoist, Andy Goram, Mark Walters, Mark Hateley, Ian Durrant, Gordon Durie, Alec Cleland, Stephen Wright, John Brown, Stuart McCall and Charlie Miller. Rangers clinched their stunning ninth successive League Championship with victory over Dundee United on Wednesday 7 May 1997 and this stunning hand signed shirt celebrates a golden period in Rangers illustrious history. Presented in A1 Sporting Memorabilia’s exclusive classic shirt framing. Approximate size: 34.5 (H) x 24.5 (W) x 1 (D) inches. Signed by: Alec Cleland, Ally McCoist, Andy Goram, Charlie Miller, Gordon Durie, Ian Durrant, John Brown, Mark Hateley, Mark Walters, Paul Gascoigne, Stephen Wright, Stuart McCall. Every signed item we sell is genuinely hand signed. Due to the fact that every signed item we sell is hand signed the image displayed of the product is used as an example – the signature size, position and style may vary slightly. Every signed product is issued with a Certificate of Authenticity (COA), which guarantees that every item has been hand-signed. The certificate includes many security features to avoid duplication and protect your investment. Below is an example of our Certificate of Authenticity. With the marketplace now flooded with fakes it is very difficult to distinguish between genuine items that have to potential to increase in value and worthless counterfeits. A1 Sporting Memorabilia puts its name to every item because all of our signed items are 100% genuinely hand-signed. We conduct official signing sessions, where every star is paid for each individual signature. There can be no marketplace without these sportsmen, so we consider it fair to pay them for their signatures. Certificate of Authenticity – Each item comes with a COA issued by A1 Sporting Memorabilia. Private signing sessions – Ideal conditions for best examples of perfect autographs. Photographic evidence – We are happy to provide online, where possible, a wide range of photos that clearly show the player at a closed signing session arranged and conducted by A1 Sporting Memorabilia or, at the very least, a trusted partner. Video proof We have developed a unique style of authentication video, which creatively showcases both our products and our connection to the players who sign for us. Verifiable company history – A1 Sporting Memorabilia has a long history supplying memorabilia. Exclusive contracts – We have many exclusive contracts with sport legends. High quality of products – We have the highest possible standards for our products. The materials used and presentation of our items is always of the highest quality to achieve a piece of sporting history. Product range – An ever changing and stunning range of over 2000 unique products and growing! About A1 Sporting Memorabilia. A1 Sporting Memorabilia is Europe’s largest distributor of authentic signed sports memorabilia, and has established itself to become the leading challenger in a global sports memorabilia market. At A1 Sporting Memorabilia, we not only have the highest standards of authenticity but we also combine this with unique products and exclusive arrangements with the biggest names in sport. Founded in 1995, A1 Sporting Memorabilia was previously owned by Terry and Freda Baker of A1 Sporting Speakers – their close relationship with sports stars through their after dinner speaker agency formed the foundation of A1 Sporting Memorabilia and its vast collection of genuine signed sports memorabilia. A1 Sporting Memorabilia has arranged hundreds of signing sessions with sporting stars including legends such as Pele and Diego Maradona, modern greats like Gianfranco Zola and Dennis Bergkamp, and current superstars including Cristiano Ronaldo and Wayne Rooney. A1 Sporting Memorabilia have the highest possible standards for our products and service. If you have any queries regarding A1 Sporting Memorabilia or our products that is not covered in the text above then we are happy to help and answer any questions you might have. To contact our customer services please use one of the methods below. Postal address: A1 Sporting Memorabilia Unit 20, 12 Airfield Road Christchurch Dorset BH23 3TG United Kingdom. We welcome enquiries from business and organisations that wish to place multiple orders of authentic signed memorabilia from us. We offer excellent discounts on retail prices for individual orders of 10 items or more. There are also opportunities available for you to pre-order items for upcoming exclusive A1 Sporting Memorabilia signing sessions. Signed Arsenal Football Memorabilia. Signed Celtic Football Memorabilia. Signed Chelsea Football Memorabilia. Signed England Football Memorabilia. Signed Everton Football Memorabilia. Signed Liverpool Football Memorabilia. Signed Manchester United Football Memorabilia. Signed Tottenham Hotspur Football Memorabilia. Signed West Ham Football Memorabilia. Signed World Cup Football Memorabilia. Wayne Rooney Signed Memorabilia. Steven Gerrard Signed Memorabilia. Paul Gascoigne Signed Memorabilia. Eric Cantona Signed Memorabilia. Paul Scholes Signed Memorabilia. Kenny Dalglish Signed Memorabilia. Jimmy Greaves Signed Memorabilia. Ryan Giggs Signed Memorabilia. Bobby Charlton Signed Memorabilia. Luis Suarez Signed Memorabilia. Lionel Messi Signed Memorabilia. Cristiano Ronaldo Signed Memorabilia. Jamie Carragher Signed Memorabilia. Alan Shearer Signed Memorabilia. Gareth Bale Signed Memorabilia. Ian Wright Signed Memorabilia. Muhammad Ali Signed Memorabilia. Anthony Joshua Signed Memorabilia. Mike Tyson Signed Memorabilia. Frank Bruno Signed Memorabilia. Joe Calzaghe Signed Memorabilia. Manny Pacquiao Signed Memorabilia. Henry Cooper Signed Memorabilia. The item “Framed Rangers Mutli Signed Shirt 9 In A Row League Championship Wins” is in sale since Wednesday, October 26, 2016. This item is in the category “Sports Memorabilia\Football Memorabilia\Autographs (Original)\Signed Shirts\Premiership Players/ Clubs”. The seller is “a1sportingmemorabilia” and is located in Christchurch. This item can be shipped worldwide.